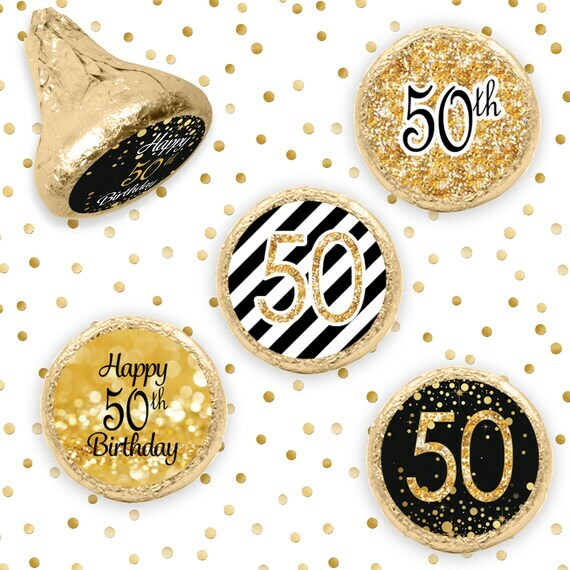 50th Birthday Stickers: each set includes 216 round stickers (2 sheets total). ● Theme: black and gold. (Not real glitter, simply printed designs). ● 9 unique designs included per set. ● Printed & Shipped To You. *Made to fit perfectly on the bottom of Hershey’s® Kisses candy. Always Faux Glitter - No Mess. At this time we do not offer personalization, color changes, variations, quantity changes, or instant downloads on any of our products. All products ship exactly as described and pictured in the listing. We strive to create the highest quality designs and want our customers to see their exact order before purchasing. Thanks for understanding! If you have a question, please do not hesitate to ask…I always try and respond very quickly to questions and you will never wait more than 24 hours for a response. This item is for personal use only. Distinctivs retains all rights. This item may not be copied, shared, forwarded, sold or distributed.